The EZB is a table top, single shuttle heat sealer with automatic cycle. 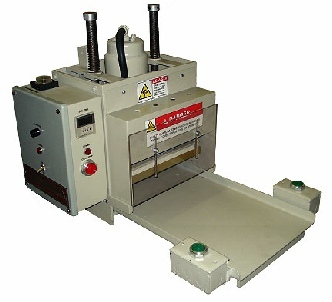 The large 10″ x 10″ time and temperature controlled high pressure seal platen makes it ideal for production runs. Tooling can be made from wood, aluminum and phenolic with changeovers made in seconds. Materials such as blister cards, medical trays, aluminum foils, Tyvek, thin plastic lid stock and clamshell blisters may be sealed. Typical applications for this machine are blister packs, food trays, unit portion packs, fold-over cards, pharmaceutical, medical packages and special seal applications.